Although a briefcase might be a little liability for security team to have, especially in crowded streets, but it can be a lifesaver. You can have a briefcase that serves other purposes, other than carrying your laptop or your documents. You can have a bulletproof briefcase that can come in handy when you find yourself caught in the middle of a shootout. 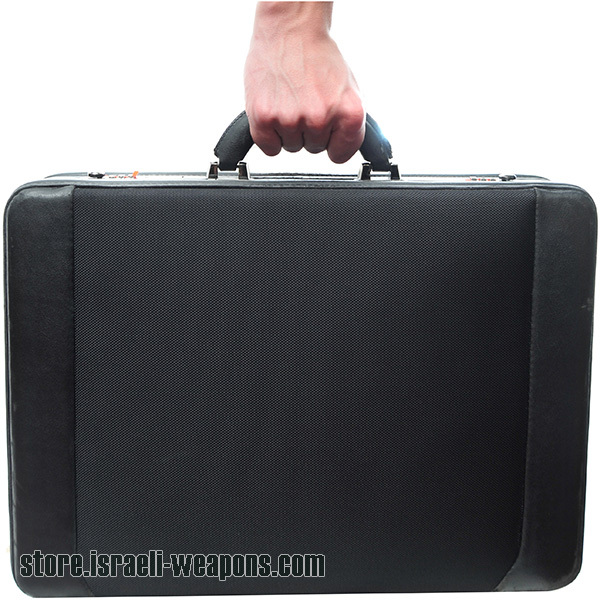 It is light to carry, and certain briefcases can unfold to full body length. If someone attacks with a short gun, a knife or a pistol, you can use the ballistic briefcase as a shield, and it will keep you away from harm. The briefcase opens to become a bulletproof shield that can protect you in time of trouble. The bullet proof briefcase is lightweight as it made from Kevlar or another soft armor material. It can withstand the impact of a pistol, and it depends on it protection rating, usually it come with IIIA Kevlar protection. Typically, it can stop a .44 magnum bullets as it is rated IIIA. Essentially, the ballistic briefcase is a perfect alternative or addition to the bulletproof vest. Instead of wearing the bullet proof vest, which weights a few pounds heavier, another choice to use bulletproof bag or bulletproof backpack, and it will be equally effective by your bodyguard, especially if you are in a high hostile area. Furthermore, it is an excellent disguise, because it not easy to distinguish between an ordinary bag and bullet proof bag. In addition, the bullet proof bag is a sleek bag, and you can move around without any inconveniences. It is light in weight, and a child can carry it effortless. Also you can put lightweight armor plate as level III and IV inside it against higher calibre bullets. Bulletproof bag or a bulletproof briefcase is an alternative solution to wear a body armor, and it can save your life in case of trouble. It is important to note these products can unfolds with ease because it is specially designed for emergency purpose. In this regard, ease of use is its greatest advantage. Moreover, the bullet proof bag can serve as an ordinary laptop bag because it has a utility compartment where you can put your laptop. If you need to carry a weapon, you can put your firearm and other concealed field gear inside the bag compartment. It can provide safety when you work in insecure areas. A quick reflex on your part or quick reaction of your bodyguard can catch the assailant off-guard. If you work in an unsafe location, you can get the bulletproof bag in order to keep you safe. You can use it as a shield, and it will come as a surprise to the attacker because it looks like an ordinary bag. It can save your life by keeping you safe and prevent injuries inflicted by the shooter.